George Scarborough was born in Louisiana on 2nd October, 1859. His family moved to Texas and for a while worked as a cowboy. In 1885 he was appointed sheriff for Jones County. Later he worked as deputy marshal at El Paso, Texas. On 21st June, 1895, he killed Martin Morose, a Texas rustler. 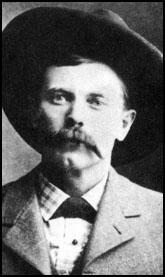 In 1895 John Wesley Hardin claimed that he paid Scarborough and Jeff Milton to kill Martin McRose. Milton and Scarborough were arrested but Hardin later withdrew his comments and the men were released. On 18th August, 1895, John Selman shot John Wesley Hardin in the back of the head while he was standing at the Acme Saloon Bar. Selman was murdered by Scarborough on 6th April, 1896. Scarborough now moved to Deming, New Mexico, where he worked as a gunman for the Grant County Cattlemen's Association. He was also associated with the arrest of Pearl Hart. On 5th April, 1900 Scarborough was involved in a shoot-out with George Stevenson and James Brooks. He was shot in the leg and he had to be taken back to Deming where he had his leg amputated. He died the following day.